More Hearts, despite the title, is not a slot machine about playing cards or about love. It’s actually a bit of a mix between different things, the symbols consisting in wild animals, birds, insects and flowers, with a couple being gift boxes or diamonds. As you can see, Aristocrat didn’t choose a very clear message to send here, with the background being the only place where the said hearts are visible. 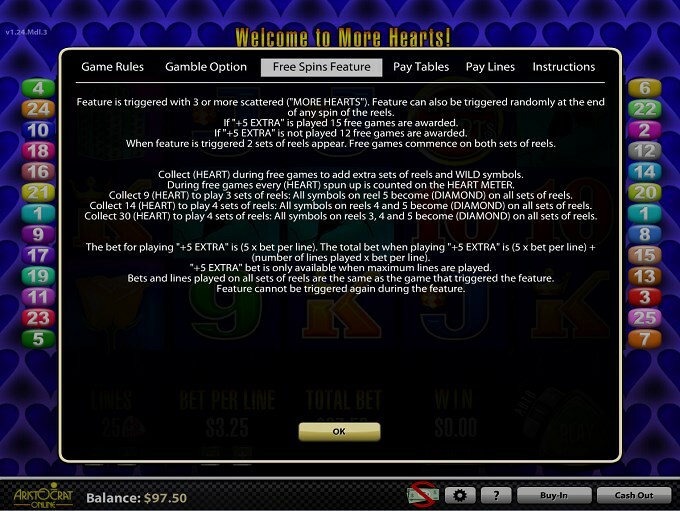 5 reels and up to 25 bet lines are offered in More Hearts. This slot offers wilds, free games and scatters, plus top payouts of $6,500. The features that you can expect in this game are typical for a modern slot, offering you wild symbols, scatters and free spins which can have up to four active sets of reels spinning for you. The Diamond symbol is the slot’s most important feature, mainly because it offers you the biggest payouts when it forms a combination. The symbols are required to appear on the same bet line and from left to right, and if that happens with two to five symbols, you get paid between 25x and 2,000x the line wager. The rest of the time, the Diamond will act as a wild symbol, meaning that it is a bit of a Joker, substituting for other symbols and allowing you to form new combinations by being at the right place and the right time. The More Hearts Logo symbol is also important, but not by offering you prizes directly. Instead, it is the scatter symbol of the game, allowed to appear in any random position. As long as you get at least three of them during the same spin, you will get a small reward of 2x the total bet and access to free spins. 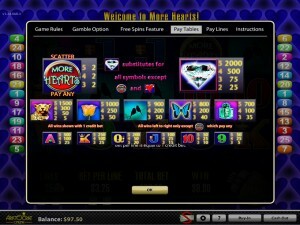 The slot has free spins to give you, as long as you get the required 3+ scattered Logos during the same round. The trigger of this feature can also be activated at random, at the end of one of the base game spins. Depending on whether you used the extra bet or not, you will get 15 or 12 free spins out of it. These spins will put two sets of reels on the screen, both playing for free. Collecting Heart icons as you go through the free spins will allow you to unlock additional sets of reels and also extra wilds. You need 9 hearts in order to get the third set of reels, 14 to get the fourth as well, while 30 will make the last three reels into Diamond wilds. The wagers you get to place in this slot cover 25 lines, plus an extra bet which takes another 5 coins. The total number of coins which can be used is 30. As for the denomination of those coins, they start at $0.01 and can reach a top value of $3.25. That means that you can wager up to $97.50 each spin. The slot’s biggest rewards will give you back 2,000 times what you’ve put on a single line. The cash value of the prize will go as high as $6,500. As I’ve mentioned above, the design doesn’t actually have that many hearts in it, with the exception of the background picture, which is full of them. On the reels, you will encounter two types of symbols. The first category would consist of the themed symbols, the ones with birds, flowers and animals. The second one offers you playing cards, quite boring ones unfortunately. Symbols: Diamond (wild, 2,000x), More Hearts Logo (scatter, 2x the wager), Leopard (1,500x), Rose (1,000x), Birds (900x), Butterfly (800x), Gift (700x), Ace (500x), King (250x), Queen (200x), Jack (100x), Ten (50x) and Nine (50x). 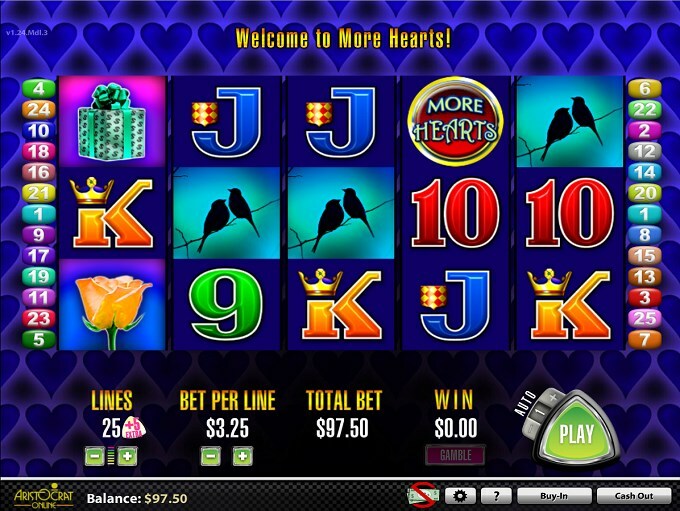 The game’s theme is not going to convince you on its own to give the slot a chance, but the free spins and their use of up to four sets of reels on the same screen might do that. 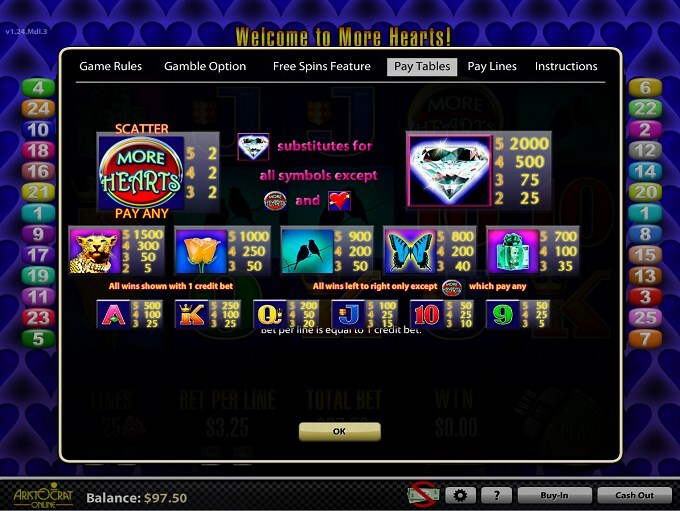 The More Hearts slot machine is offered through the Aristocrat platform, so if you want to play it for real or just to practice, look out for casinos that use it.